The 2012 IRC was a quantum leap with respect to energy efficiency. For the first time in residential construction, all homes built under the 2012 IECC have to be tested by a 3rd party for whole house air leakage (blower door testing) as well as duct tightness if any portion of the duct system (unit included) is outside the building thermal envelope. The multi-family arena qualifies under the IRC in almost all circumstances and is subject to these changes. Most multifamily units will incorporate closet air handlers or pancake units and ducts within the floor system or drop soffits allowing for the exemption of duct leakage testing. However, there is no exception for the envelope leakage testing. Most municipalities will allow you to “sample” in order to keep the scope of work and costs reasonable. There is little to be gained by testing each individual unit if the construction practices are uniform throughout construction. The only way to know your municipality’s requirements is to ask—and even then you may get conflicting responses. A good “default” is RESNET Chapter 6 Sampling Protocol. If your city or town doesn't have a method in place, go ahead and suggest they follow that standard. A major problem with testing small homes in general is that they have a disproportionate ratio of common leakage areas. For example, a 2700sf 4BR 3BA home is likely to have a range vent, dryer exhaust, 5 or so exhaust ducts and a fresh air ventilation system. A 1350sf 3BR 2BA apartment may have the exact same amount of exhausting appliances sans a few exhaust fans. The result is that as the square footage (or more accurately, volume) increases, it does so in a way that favors larger homes. Multi-family homes face another dilemma. They are designed with adiabatic (shared) walls that are typically not air sealed due to the fact that the adjacent units will be conditioned as well. Energy raters should take note that the sealing of receptacle boxes in the same stud bay for different units must be sealed per the 2012 IFC (fire code). Proper execution of the fire code will help reduce infiltration between units. Regardless, special consideration should be taken to these walls as well as exterior wall systems since the leakage at final will not be isolated to the exterior wall systems. Lastly, even with ICAT rated can lighting and other quality building practices, there will be some amount of connection between the ceiling/floor system and the livable space. Common areas of connection include failure to seal supply and return cans/boxes to drywall, gasket failure on ICAT lighting, duct leakage, top plate to drywall intersection and other ceiling penetrations. If the systems are connected, you can pull air from adjacent units to either side if the units are not properly compartmentalized. Again, a continuous firewall should help this area but in real world scenarios—we do see unsealed pipes and wires go unnoticed. In summary, there are a lot of ways that multi-family units can fail the blower door test at final. Proper planning should be taken to ensure there isn’t a major problem at final that will delay the project being turned over and incur unexpected repair costs. In the conceptual phase, ensure the building thermal envelope is defined and there are no major points of breakdown. Ensure your mechanical designer or contractor use install dampers where needed. Go ahead and put it in someone’s scope of work to seal the exhaust fans, supply boots and return can(s) to the ceiling drywall with generic acrylic-latex caulk. This is a small detail that is a good building practice that can reduce headaches later on. While framing, have your energy rater perform a site walk to ensure there are no major problem areas. Look at a few different unit types in a few different layouts (i.e. Unit A –Ground, End, Unit A- Top Mid, Unit B, Mid Mid, etc). If you’ve done everything thus far, you shouldn’t have to hold your breath while the blower door fan kicks on at final. The biggest obstacle we see in the multi-family arena is that our builders are unfamiliar with the process. Hopefully this article sheds some light on the situation. And, as always, the biggest piece of the puzzle? Communication! Quality duct design can create a comfortable environment for occupants. Software programs Wrightsoft and Elite Software that utilize ACCA Manual D help create designs that will provide the recommended air flow for a given room or area based on variables like insulation, glazing specs and areas, room size, orientation, etc. But once the plans are stamped and ground is broken, the focus shifts from planning to reality. And the reality is the importance of excellent installation practices has never been more important. In Phoenix, the majority of custom residential builders have shifted to conditioned attic systems (insulation applied to the roof deck). This installation strategy reduces the heat gain on the duct system but does not diminish the importance of duct sealing with respect to indoor air quality. Indoor air quality, the oft forgotten benefit of a tight duct system, can suffer drastically if the system isn't air tight. Proper practices include sealing all transitions (i.e. Y's, S-Drives, etc) with mastic (duct sealant) or metal tape/sealant combination. Flex to collar connections should be secured with a zip tie and sealant. Collars to plenums should be secured with sheet metal screws and followed with sealant to prevent any leaks. Remember, leaks on the return side will result in filter bypass and can expedite coil clogging-- which is a direct performance issue that will result in higher energy bills for the occupants, reduced air quality and potentially comfort complaints and service calls from a system freezing up. Leaks on the supply side directly reduce the amount of air flow to that was engineered at conception. It can also pressurize the attic system which (depending on the design) could create problems. Furthermore, kinked/smashed/poorly routed ducts can reduce the recommended amount of supply air too. Once the HVAC contractor finishes their installation, the drywall contractors will cut out a hole for each supply and return can. Unfortunately, no one is perfect and the gaps around each supply boot and return can contribute to duct leakage if left unsealed. Caulk is the easiest and most durable choice of sealant for this application. For our firm, if we are performing a duct leakage test at final-- we require the contractor to seal these junctions before we test. We typically see about 2-3% of CFA (conditioned floor area) leakage from this item. When you consider the 2012 IECC only allows for 4% total for the entire system, you recognize this is a major contributor of duct leakage. Creating a tight duct system combined with routine filter change-outs and a well-maintained home can lead to better health for our tenants. Caulk and duct sealant is cheap. Quality is tough to come by. If you're a HVAC contractor, it is time for you to take the next steps... because code is starting to require it. Fiberglass batts remain in existence (and prominence) today not because of their superior performance but rather their cost and ease of installation. After all, time is money. With fiberglass batts you save on material costs but also don't have to wait for off-gassing of foam or drying of wet-spray cellulose. But what we often forget is that after we drywall, our clients live with our choices. And fiberglass batts strapped to the roof deck are a bad idea, 100% of the time. We've seen it multiple ways. Batts 'secured' to the deck with insulation hangers between top chords or more commonly, tension cables secured at the ridge and eaves with eye hooks to prevent fall out. Here is a fact: If you use air permeable insulation and it is not in direct contact with the air barrier (in this case, the plywood roof deck), you will experience convective loops within your assembly as well as unwanted radiant heat transfer. Out here in Arizona, when you have 120F ambient temperatures the roof deck reaches outrageous temperatures... even with clay tile roofs outperforming asphalt single roofs. 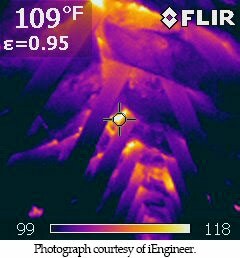 So the importance of a thermal assembly making contact with your air barrier is even more important! Unfortunately, not every home is built right the first time. The IR picture is taken on a typical summer day in Phoenix. Notice the ridge is illuminated at approximately 118F. After analysis using BPI methodology for deducing R-Value of misaligned batts, it was determined that the attic insulation for this example was performing at R-7... despite the fact that it was 10" R-38 unfaced batts that were installed. Building on the previous example, the expected attic temperature was 80F (remember, sealed/conditioned attic space) but in the afternoon it was recorded at 93F (+13F). The result was that the mechanical equipment and duct work were exposed to unexpectedly higher temperatures. Because the duct work was initially designed to be in conditioned space, the R4.2 flex was now susceptible to heat gain and the homeowner was unable to cool their home effectively. Even after upsizing the unit a half ton, there were still comfort complaints. Especially on supplies that were at the end of the run. application. The cellulose made contact with the roof deck and effectively reduced the convective loops and radiant heat transfer to a point where the homeowner was able to be comfortable and have vastly reduced energy bills. In the above example, the mechanical engineer designed a system utilizing ACCA Manual J, S and D. The energy rater contracted to inspect the insulation was unable to verify whether the batts were in complete contact with the deck. It looked okay-- so it was approved. Had the application been found to be unacceptable, all of the headaches would have been avoided. The moral of the story? Pay attention to your material choices and their applications in the design phase. Spend a little more to prevent big problems down the road. And if in doubt, consult with an energy rater before making a costly mistake. This article wasn't meant to discredit fiberglass batts in all applications. But it is meant to clearly state that they have no business in a sealed attic. Some governing bodies will no longer allow the application due to issues with condensation control. See below for 2012 IRC language. R806.5 Unvented attic and unvented enclosed rafter assemblies. 2. No interior Class I vapor retarders are installed on the ceiling side (attic floor) of the unvented attic assembly or on the ceiling side of the unvented enclosed rafter assembly. 3. Where wood shingles or shakes are used, a minimum 1/4-inch (6 mm) vented air space separates the shingles or shakes and the roofing underlayment above the structural sheathing. 4. In Climate Zones 5, 6, 7 and 8, any air-impermeable insulation shall be a Class II vapor retarder, or shall have a Class III vapor retarder coating or covering in direct contact with the underside of the insulation. 5.2. Air-permeable insulation only. In addition to the air-permeable insulation installed directly below the structural sheathing, rigid board or sheet insulation shall be installed directly above the structural roof sheathing as specified in Table R806.5 for condensation control. 5.3. Air-impermeable and air-permeable insulation. The air-impermeable insulation shall be applied in direct contact with the underside of the structural roof sheathing as specified in Table R806.5 for condensation control. The air-permeable insulation shall be installed directly under the air-impermeable insulation. 5.4. Where preformed insulation board is used as the air-impermeable insulation layer, it shall be sealed at the perimeter of each individual sheet interior surface to form a continuous layer. a. Contributes to but does not supersede the requirements in Section N1103.2.1. As 2014 begins, we'd like to announce a few immediate changes for DSCC. Rates unchanged for 2014: We maintain a $0.10 per heated/conditioned square foot fee with $250 minimum. Turnaround Time: We've reduced our turnaround time from 5 business days to 2 business days, standard. We are excited about the reduced turnaround time for our clients moving forward; some of our best feedback has been our speedy turnaround. We hope to build on that in the new year. You may find yourself asking, why pay for a service that I can perform in house? Well, first off, at DSCC we offer guarantee on our work. That means if your plan is rejected by the city and it turns out to be our fault-- we redo the model and we will refund the money you paid us in the first place. We made this somewhat extreme guarantee to show our clients that we're crazy about perfection and that nothing else is acceptable. Secondly, you could train an architect to run the energy models, but that takes time and money. Plus, once he or she learns to accurately model the homes-- how long will it take them? Our pricing is low because our experts are incredibly efficient. At the end of the day, it's your call whether to request our services or not. But if you do, we'll be here-- ready to honor our guarantee. Welcome to DSCC. The first one's on us. Thanks for checking us out. We're online and ready to work for you tomorrow. In attempt to earn your business and trust, we'll be offering you a complimentary code compliance report. It'll be valid through September of 2012 so if your turning out a new batch of plans, this is a great opportunity to save even more money off our already low rates.